Composite materials include any products made from a blend of two or more base materials, according to the University of Delaware's Center for Composite Materials. By mixing multiple materials together, manufacturers can combine the best properties of each base component. Composite materials typically offer enhanced strength or durability over many other products and may provide additional benefits like resistance to moisture or corrosion. Some examples of composite materials include fiber cement, thermoplastics or composite wood products. Composite products are used in a variety of residential and commercial construction applications. Entire homes can be framed using plastic-laminated beams and trusses instead of traditional wood framing. By coating the beams with plastic, manufacturers reduce the risk of rot or termite damage, which extends the life expectancy of the structure. Similar products are used to build outdoor decks and porches. 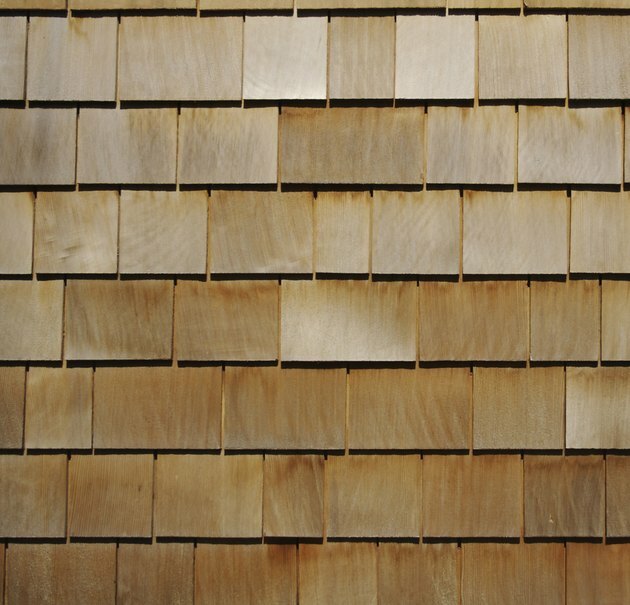 Fiber-reinforced cement shingles create a maintenance-free roof that lasts for decades, while fiber-cement siding offers the look of wood without the maintenance. Doors and flooring made from composite materials mimic the look of wood and often cost much less. Fiber-reinforced panels, or FRP, are used on many bathroom and kitchen walls to create a durable and waterproof surface that's easy to clean. According to the Australian Academy of Science, modern aircraft would be much less efficient if composite materials weren't available. Composites like fiberglass-reinforced aluminum or carbon fiber create materials light enough to fly, but strong enough to handle the pressure of high altitudes and frequent abuse. Items such as the wings and tail of an aircraft as well as the propellers and rotors are often made from composites. These materials hold up under a wide range of temperatures and are highly resistant to rust and corrosion. In terms of aesthetics, many composite materials used in aircraft construction are easy to shape and mold to fit design and engineering plans. A number of different sports products include composite-based components. Many modern baseball bats are either made entirely from metal or wood composites or include a composite handle to resist breakage. Golf and tennis manufacturers also rely on composites to improve strength and reduce weight in clubs and rackets. Other sporting equipment, including surfboards and skis, contains composite materials that add flexibility while maintaining durability. Many modern boats are made from composite materials such as fiberglass or thermoplastics. While traditional wooden boats were subject to rot or warping over time, and metal boats were heavy and likely to rust, composites offer superior performance and reduced maintenance. They are lightweight enough to stay afloat, yet strong enough to resist punctures and cracking. Most composite boats are unlikely to corrode, even after frequent exposure to salt water and sea air. In addition to racing and pleasure boats, composite materials are used on kayaks, canoes and jet skis. Carbon-based composite fibers are often used to make bulletproof vests and other ballistic protection devices. These fibers, including Kevlar, produce fairly lightweight body armor options that offer effective protection from bullets, flames and some explosives. According to the Massachusetts Institute of Technology, Kevlar is five times stronger than steel and yet only half as dense as fiberglass. Along with other composite fibers, Kevlar has saved thousands of lives and revolutionized protective gear for lawn enforcement and military personnel.